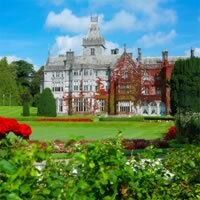 Adare is set in a picturesque location hugging the wooded west bank of the River Maigue on the busy road leading to Killarney. 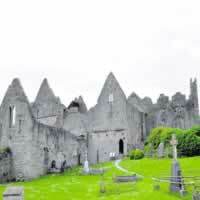 It is renowned as one of Ireland`s prettiest villages, and is designated as a Heritage Town and has won many prestigious Tidy Town Awards. Snuggled in a wooded setting among the rich quiet farmlands of the Golden Vale by the River Maigue, Adare is a model village dating from the time of the Norman Conquest. 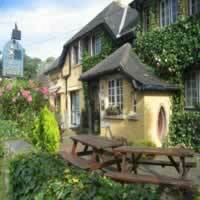 It has been home to the Earls of Dunraven for over three centuries. Thatched cottages line its broad street, punctuated with beautiful stone buildings and picturesque ruins. The River Maigue flows under a graceful stone bridge and alongside medieval monasteries which quietly count the passing centuries. The entrance to the village from the east gives way to views of ancient buildings including the Norman built Desmond Castle on the banks of the Maigue while the 19th century Neo Gothic Adare Manor set in 840 acres of parkland and nestled among tall oaks was home to the Dunraven family until 1982. In the early 19th century, the Earl of Desmond, laid the plan for the existing streets and townhouses of Adare. These lands and dwellings were rented to tenants, under various agreements, some of which still exist today. Today, Adare village is an architectural wealth of scenic beauty. The mix of centuries is blended into everyday life as some of the thatched cottages are home to arts and crafts shops. The main street of Adare is punctuated with beautiful stone buildings, medieval monasteries and ruins and the picturesque village park. Adare`s streets are lined with original thatched cottages survived for hundreds of years. Some of the cottages are kept by local restaurants and Arts & Crafts shops, but many are still privately owned. Located in the heart of County Limerick just 15 minutes south of Limerick City on the N21, and 40 minutes from Shannon airport, Adare borders the counties of Kerry, Cork, Clare and Tipperary. Crossing the bridge over the river Maigue to the Adare Manor Golf Club, the friary is a characteristic example of the monasteries erected in Ireland during the 14th and 15th centuries. 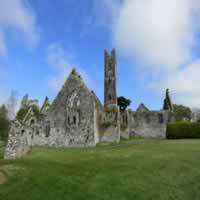 It was founded in 1464 by Thomas, the 7th Earl of Kildare, for the Franciscan Friars of the Strict Observance. Although now in ruins, the remaining walls show a remarkable outline of its former elegance. St. Nicholas Old Graveyard is located beside Adare Manor Golf Club, on the outskirts of the village, as you arrive from Limerick city. Within the graveyard is the old parish church of St. Nicholas, built in the 13th century and then rebuilt in the 16th century. On your visit you will also see the ruins of a second church, a Chapel of Ease, dating from the 16th Century, where several members of the Dunraven family were buried. The local Adare Heritage Center gives a deep insight into the history of the village with an interesting exhibition and also hosts a number of craft shops and a restaurant. There is an equestrian center located at Clonshire and the village is home to a number of world renowned stables.